Atlantic City Declines: Will it End in a Municipal Bond Default? The popular HBO series Boardwalk Empire portrays Atlantic City in the midst of its Prohibition-era heyday when tourists, booze and money were flowing liberally. The upcoming season will portray the ravages of the Depression, but it may not mention the downturn's impact on Atlantic City municipal bondholders. Amidst rapidly declining property tax collections, the city began defaulting on municipal bond payments in 1932 and issuing scrip (or IOU's in modern parlance) to pay its bills. By 1935, the city was in default on $2.1 million of principal and interest – the equivalent of $36 million in today's dollars. Today, it appears that history is repeating itself. As we have been seeing on Bitvore in recent weeks, prospects for Atlantic City have recently taken a gloomy turn. While the impending shutdown of the Trump Plaza Casino made national news, this is just the latest phase in a longer term unraveling caused by competing gambling venues in the Northeast and exacerbated by Superstorm Sandy. This unraveling has been covered by local media monitored by Bitvore. For example, an NBC Philadephia story noted a 5% drop in local gaming tax revenues between 2012 and 2013. The city's struggle to arrest its decline and continue performing on its $240 million in outstanding bonds should be an ongoing drama. 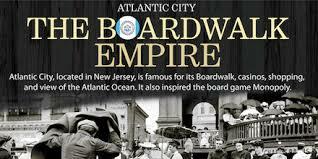 While this drama may not be the stuff of Boardwalk Empire, you can keep track of it on the pages of Bitvore.